Happy Thursday! First I want to congratulate the Chicago Cubs for finally breaking the curse and winning the World Series after 108 years. Anyways back to food it is National Sandwich Day. As I was watching world series history, the commercial for Subway came up with their promotion of buy 1 sub and drink get 1 free sub. With all due respect to the bargain eats and listing of calories promoted by Subway, I am going to share two different sandwich experiences. Both sandwiches were purchased in the Financial District during lunch both were under $10 and it feels like eating a meal for two. Both sandwiches is a perfect quick meal as you consume protein, vegetables, with or without calcium and carbs in one shot. 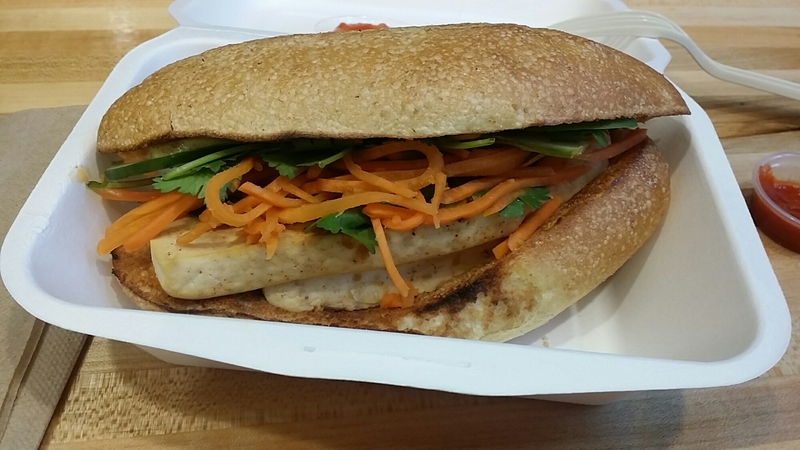 The first sandwich I had was a vegetarian sandwich from Num Pang, a Cambodian sandwich shop. There are six locations throughout the city. The shop had a great variety of sandwiches along with rice balls and drinks such as watermelon juice and Vietnamese coffee. All their sandwiches consist of freshly made semolina or quinoa baguette with pickled carrots, cucumbers, cilantro and chili mayo. One of their cheapest sandwiches that appeared to be healthy yet very tasty was their Spicy Organic Tofu ($7.95). The sandwich was freshly made and served warm. The sandwich had a perfect balance of the firm tofu and vegetables, well worth the price. Recently I was exploring Eater’s top 60 cheap eats in New York city right now. 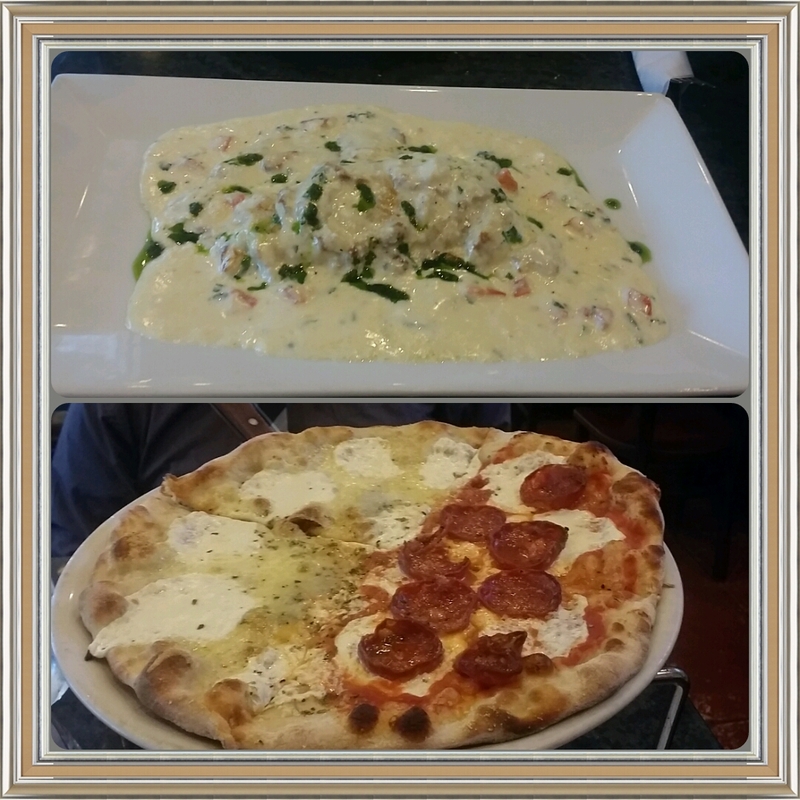 One of the restaurants listed was Grotto Pizzeria and Restaurant also located in the Financial District. This hole in the wall restaurant has been around since 1985. You have to go down a several stairs. As you enter the place looks like a regular pizza takeout spot where pizzas and sandwiches are separated and ordered separately. The guy behind the counter pointed me in the right direction to the sandwiches. 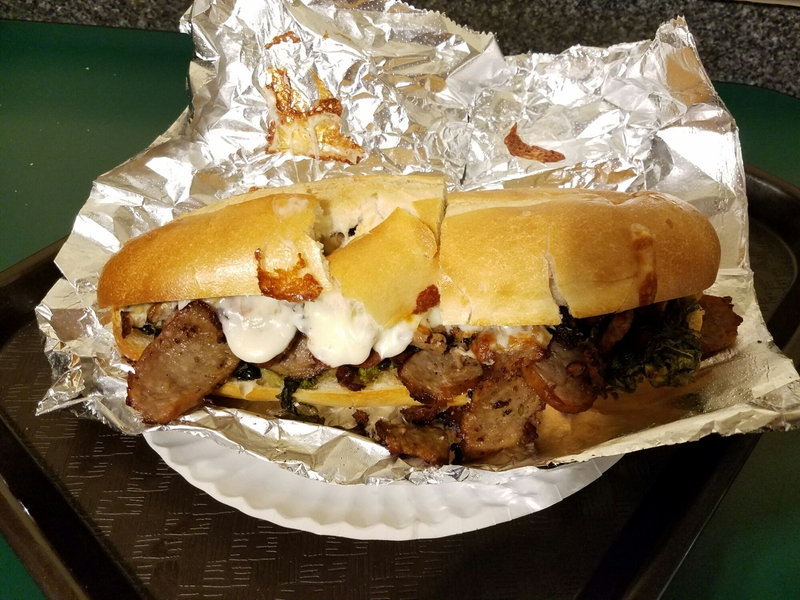 I went with the sandwich suggested by Robert Sistema and Eater, which was the the sausage, broccoli Rabe and mozzarella sandwich. I waited and ate half of this filling sandwich ($9.75 with tax). This sandwich has to be eaten with all its components in it as it had the bitterness of the broccoli Rabe, the saltiness of the sausage and the creaminess of the cheese on a fresh roll. Although I am not a sandwich person, I do enjoy a really good sandwich once in a while especially from Katz, Carnegie or Russ and Daughters. Definitely want one check out other cheap eats listed on the Eater’s top 60 cheap eats.